Welcome to my Trip Report of my first flight of my March 2016 Flying Adventure! Initially I wanted to fly to Seoul to try out Korean Air's Boeing 747-8 Intercontinental aircraft, but because I had some stuff to do in Ho Chi Minh City, I decided to postpone that plan and instead plan a trip to Ho Chi Minh and go there by a more exciting way. Normal travellers would fly there direct but for me and a few others, I want to fly new airlines and do some stop overs before heading there. After doing some brain storming, I decided on Bangkok-Ho Chi Minh route to try out Jet Airways - first thing that came into my mind. 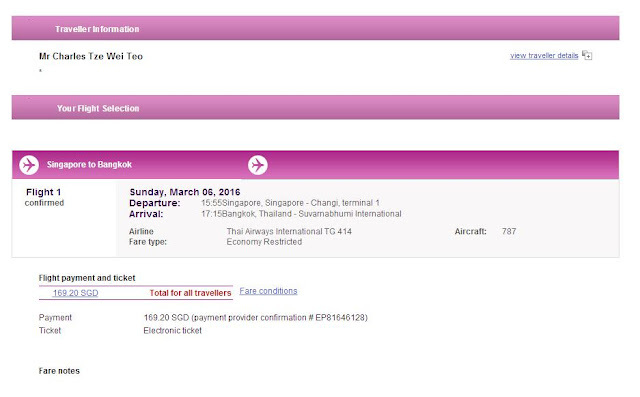 As the ticket was around S$80, I did the booking not long after. 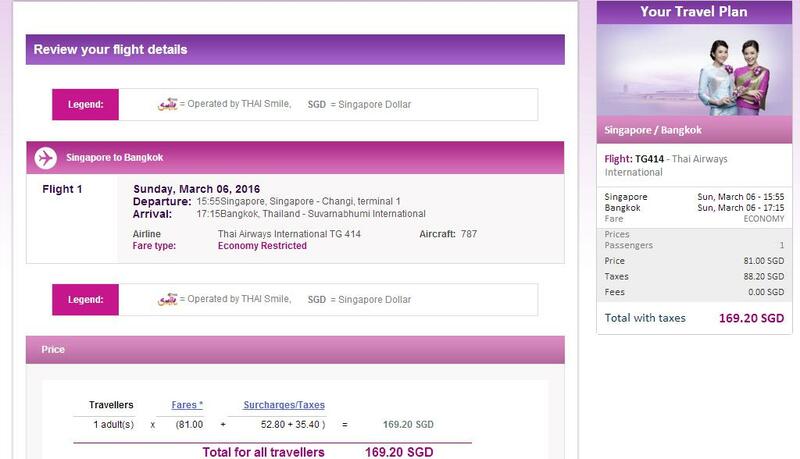 After that, I had a look at my Singapore - Bangkok option. Scoot came into my mind as it offered the cheapest airfare and the 787 Dreamliner aircraft which is a joy to fly on, but I decided to skip it because I didn't want to go to DMK Airport and besides I found something else more exciting - Thai Airways Boeing 787-8 Dreamliner on one of the daily flights (BKK-SIN-BKK sectors) and after checking the airfare, it was actually cheaper to book one way than the return, so I decided to do the one way sector and possibly fly back to Singapore from Ho Chi Minh City. I would then be staying a week in Ho Chi Minh City and since I had ample time, why not do a joyride? I had already done Vietnam Airlines' Airbus A350 (trip report) on the SGN-HAN-SGN sectors, so perhaps this time I should try out the airline's Boeing 787-9 Dreamliner aircraft. Later on, much later on in fact, I decided to fly to Manila with Philippines Airlines and Cebu Pacific's A330-300 from Manila to Singapore. Air fare from Ho Chi Minh to Manila isn't cheap - I paid about S$240 for the one way sector while for my Manila to Singapore flight, I paid about S$133 for it including seat selection and meal. Once that was done, I confirmed my accommodation and waited for the day of departure to come. No change since my last flight with this airline, taken place in 2009. 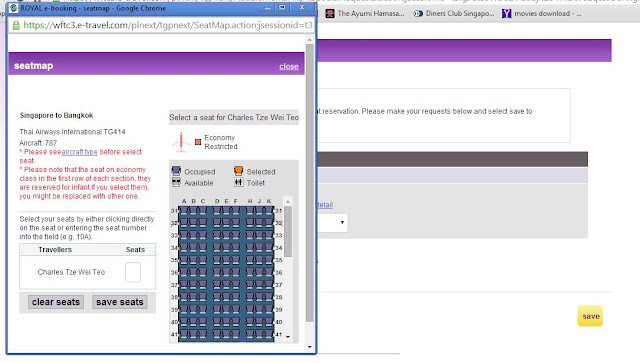 This is the Amadeus system, not a fan of it but at least it works. Price is more expensive than the Low Cost Carriers, but I am booking it just to experience the airline's Boeing 787 Dreamliner aircraft. 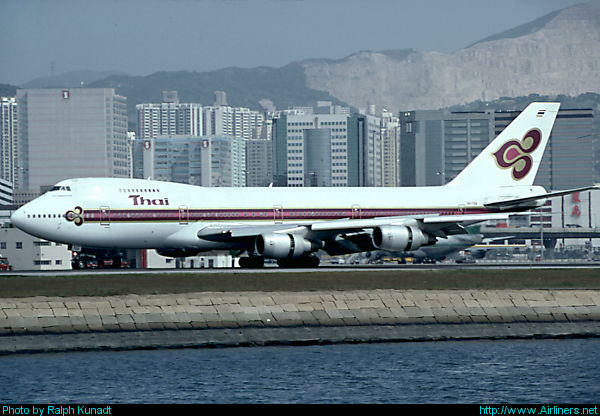 During this time, the Boeing 747-400 aircraft was operating on TG403/404 flights. 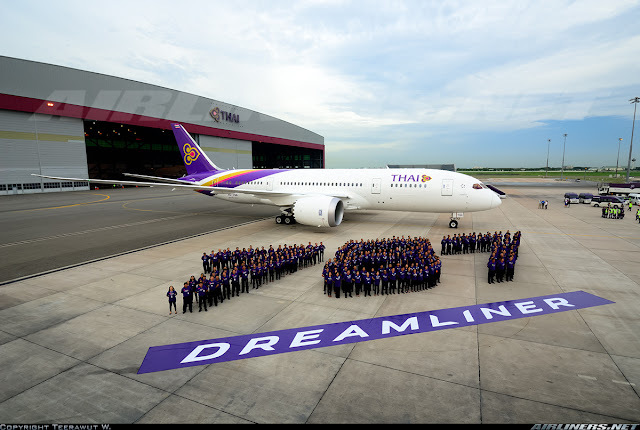 For the Boeing 787 Dreamliner aircraft, pick TG413/414. The rest are either operated by Boeing 777-200 or -300 and if you are lucky enough, you may get the Boeing 777-300ER. 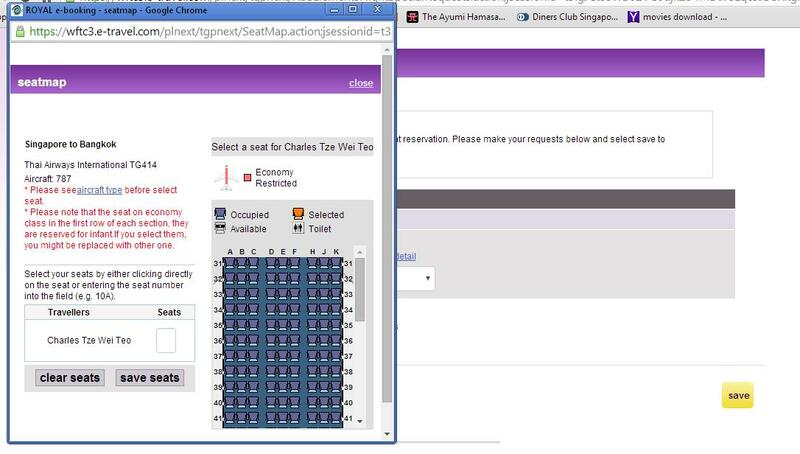 I wanted to select the seat near the front but they were most probably blocked so I had to try my luck when I do my web check-in. You have an additional option to pay for your ticket, I think that is quite convenient for those who prefer paying by cash. Within a few minutes, my booking was completed. 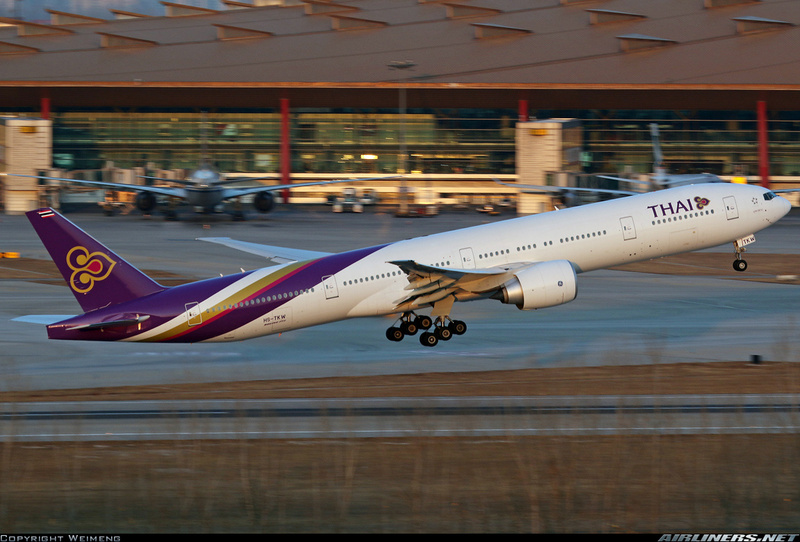 Thai Airways is the international carrier in Thailand formed in 1960. Its headquarters is based in Bangkok and flights are operated out of Suvarnabhumi Airport. 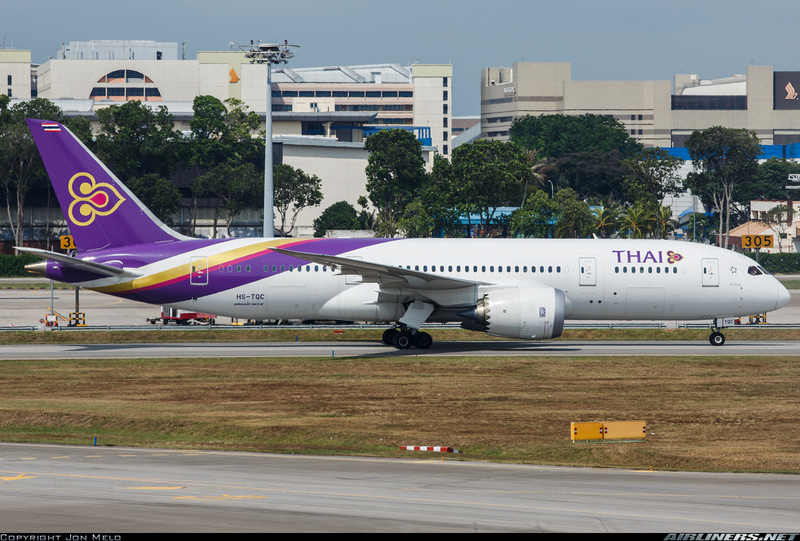 This airline has a 39% stake in Nok Air and has operates a regional carrier called Thai Smile operating Airbus A320 Aircraft. This airline is also one of the founding members of the Star Alliance. 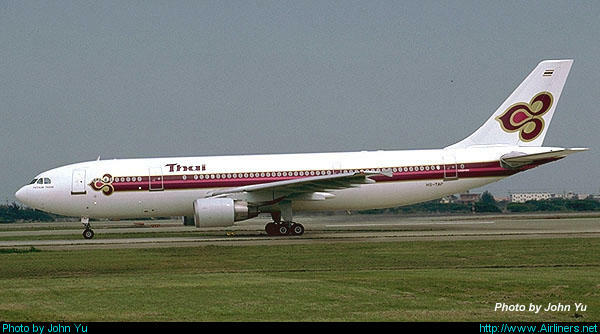 Back in the 1960s, this airline has a joint venture between itself and SAS (Scandinavian Airlines) and the European did lease some aircraft to Thai Airways for it to operate on some flights. By 1977, the Thai government bought out the remaining shares by SAS and it became a government owned airline since then. 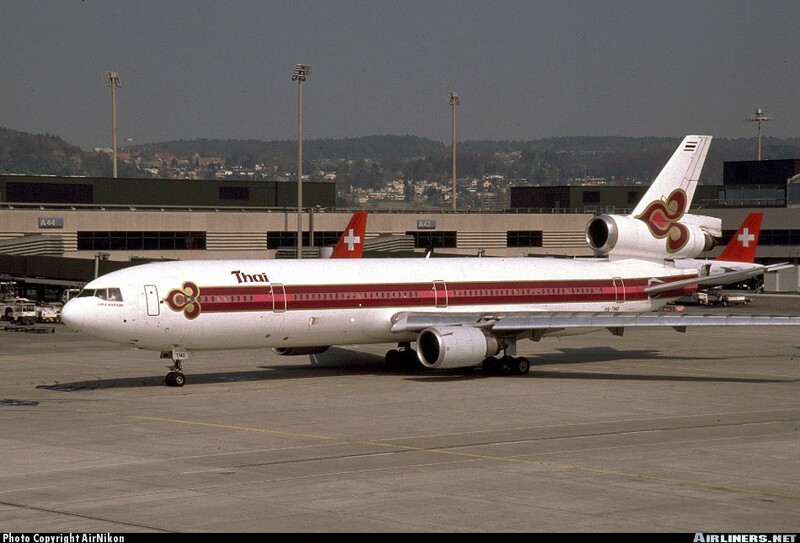 In 1997, this airline formed the Star Alliance together with United Airlines, Air Canada, Lufthansa and SAS. In both old and new livery, can you recognise them? 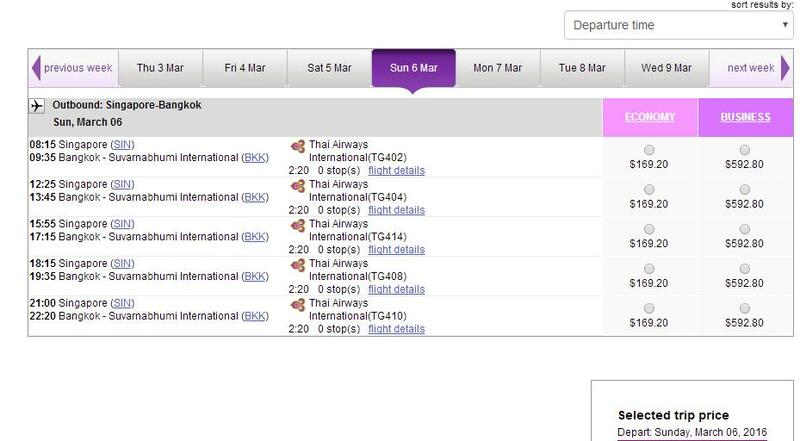 For Thai Airways flights, you can check in 24 hours before the day of departure. At this section, you can choose to change seats. Flying with Thai Airways for the aircraft type is kind of risky, because you never know when will they change aircraft type. I had it before and you check it out at this trip report. I settled for seat 36K hoping that no one would sit in the middle. Flying trips always excite me, fortunately I managed to get a good sleep the night before. Waking up around 10 in the morning, I made my way to the airport not long after. Packing was completed the night before so everything was done quickly. Once at the airport, I was searching high and low for the early check-in counters, only then I noticed the Early Check-in Lounge, it was overcrowded and small. Fortunately, I didn't have to wait very long as a separate counter for Thai Airways and a few others opened after 10 minutes of waiting and I was the 1st to be called. Do take note of this! Most of the passengers here were either flying with Emirates or British Airways. Choosing the airline option and flight number, I was in the queue not long after. Time to wait! Some vacant seats were available so I went over and waited till my turn came. The wait took around 10 minutes. Someone was earlier than me. I was 2nd to check in for the flight taking off about 5 hours later. Once I was done, I made my way to the air side to grab a bite. The long queue at the baggage storage at the air side (near the viewing mall). I settled for a Brownie Cake at Coffee Bean, found a good spot to enjoy the plane movement at the central apron. While enjoying the cake, I did a check on what aircraft was flying me to Bangkok and the honour goes to HS-TQC! The 787 Dreamliner made a detour along the way, I guess it could be weather issue. 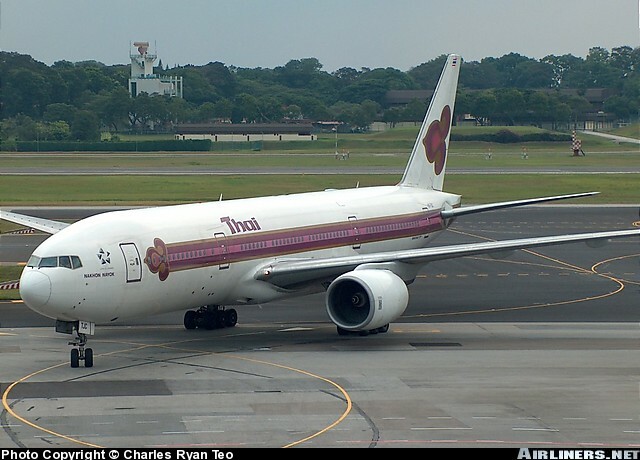 My aircraft was placed on holding pattern before arriving at Changi Airport. When the departure time came, I made my way to the gate. Flying the Boeing 787 Dreamliner has definitely excite me more than the other aircraft types. I was looking forward to this ride especially comparing to my previous experience on the 787 (Scoot), this one is equipped with IFE system and In-flight meal so everything is taken care of by the airline . Once on board, I was welcome by the purser and the junior crew members as I walked towards my seat. Boarding of this aircraft wasn't organised as no one paid attention to the boarding procedure so those Elite members and Business Class passengers would probably be disappointed with the arrangement. Here are some photos of both Business Class and Economy Class cabin. For the Business Class cabin, I had to snap them quickly as the cleaners were already coming in. 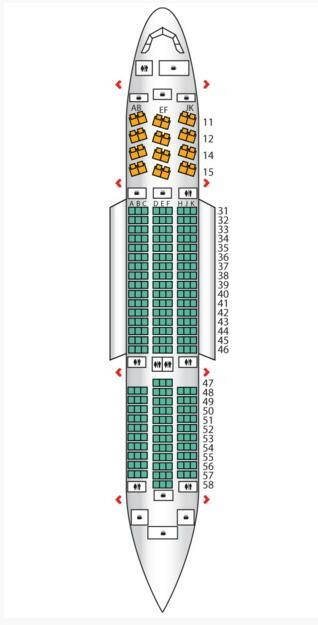 2-2-2 seating configuration for the 787's J class cabin, personally I don't find this too bad. The buttons to adjust the switch during cruising. For take off and landing, the seat must be at the original position, due to safety reason. For the AC Charging ports, it is located just behind your seat. I find it to be inconvenient. TV screen is big enough for my liking. Overall I find it to be quite comfortable, better than the staggered style J class cabin definitely. The divider as you can see in the photo abovce provides some privacy, not much but at least when sleeping it helps. Bulkhead row - slightly more legroom space than the normal rows. My seat, 36K. Thanks goodness, I had a window seat with an actual window! Somehow the seat colours remind me of the ones on Thai Smile's. You can check out the trip report over here. Legroom space is around 32' inch. Once everyone was seated, the cabin was calm especially with the Boeing Sky Interior. 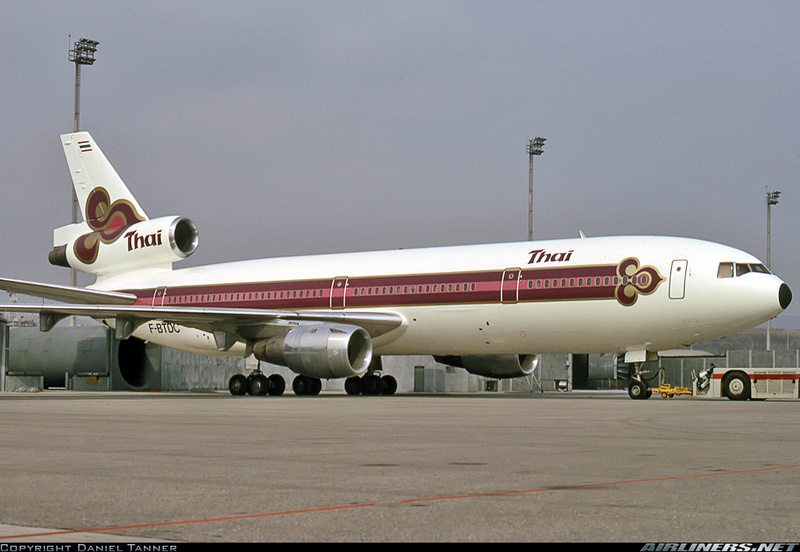 The Thai crew were at work with a full load of passengers on this flight. Since it was a day flight, it wasn't surprised that many passengers were watching movies on this 2 hour afternoon flight. The IFE system is not bad, it features quite a number of recent movies. Enough for medium-long haul routes. This is the Panasonic system eX3 selected by the airline to be installed on its newest aircraft, the Boeing 787-8 Dreamliner. I believe that the Airbus A350 and Boeing 787-9 Dreamliner will also use this system. What I like about the system is it allows you to view the flight map and seat and flight info at its main page. You have an option of using either the touchscreen or the keypad located below the screen. For me the touch screen works fine and more importantly just a gentle touch is needed to browse through the pages. Limited contents in this system and of course it can't beat Emirates for it. But still decent enough for a long haul flight. 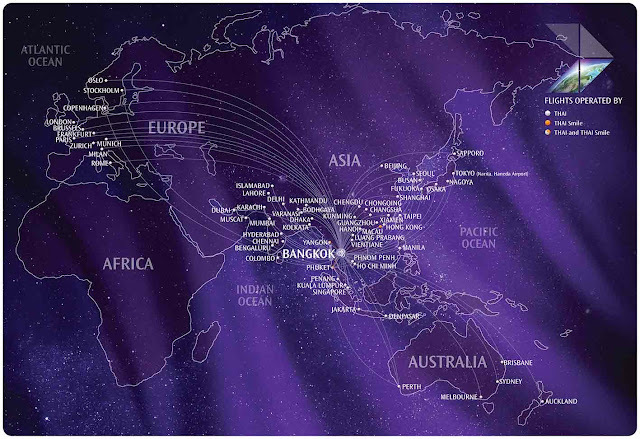 This flight map system is quite common among airlines. My flight route for the day, of course the flight can change course during the flight. WiFi was not available on my flight. This is very important for travellers! Nice to see the menu for today's flight. Not many passengers would browse through this section though. Chicken noodles was my choice. What are the other contents? Correction: There are 6 787 in the fleet at this moment. I decided to catch 'Starwars' movie, had to skip some parts as there wasn't enough time to enjoy the full movie. I did a check. If you watch the movie half way and decide to exit to check out other applications, the good news is when you return to the movie, you are able to resume the movie from where you stopped. Overall I find the system adequate and user-friendly for passengers. This is a drink holder, useful especially before and after meal. More passengers coming on board. I was hoping for the middle seat (beside mine) to remain vacant at this time. A pillow is provided for every passenger, and if you want a blanket, you have to request for one from the cabin crew. Every row has 2 AC power sockets in Economy Class for the 3-seater. For the 2-seater, only 1. Few more shots before I disembark the aircraft. Place your hand near the sensor and the toilet flush system will be activated. I had a choice between Chicken or Prawn, I chose the former. Overall, the airline meal was decent. Drink was served later with 2 cabin crew doing the drink and meal service separately. Chocolate and Vanilla Cake - if I am not wrong. I like it - not too sweet. For my flight, Gate-to-Gate IFE system was offered, meaning from very moment you sit down at your seat, you can start watching immediately and finish off the movies when it is time to disembark. Of course announcements and safety video will interrupt your programme. The 787 joyride to Bangkok was a smooth ride and some passengers noticed the difference between this and the older aircraft as I overheard their comments about the aircraft. Personally I find the 3-3-3 on the 787 Dreamliner bearable and is definitely more comfortable to fly on than the Airbus A330 (I flew on Cebu Pacific's one - trip report to come). As for the IFE system, passengers would be quite happy with it and as for the in-flight meal - it was pretty decent. 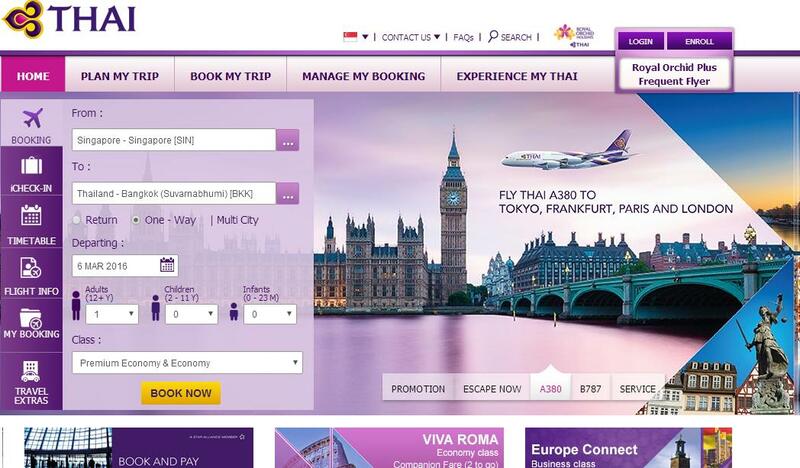 So overall, flying with Thai Airways on regional or Australian routes with the 787 Dreamliner is highly recommended. Vietnam Airlines A321 and EVA Air's Hello Kitty plane B-16722 (Click here for my trip report) are in sight! EVA Air's Hello Kitty departing for her flight back to Taipei. 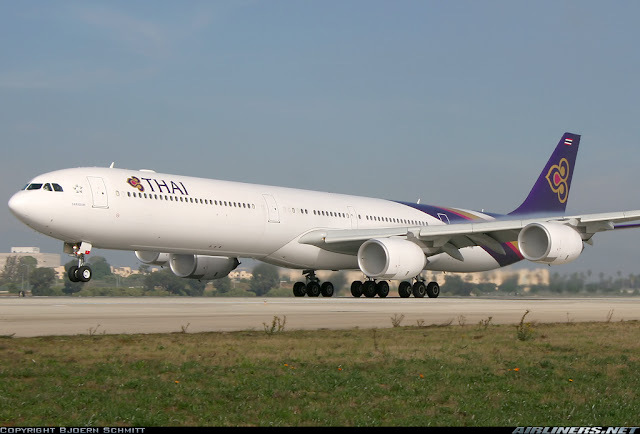 We pushed back on time and both Roll Royce Trent 1000 engines were started at the same time. Once engine start up and take off check list were completed, we had to wait for clearance before taxiing to the assigned runway. For those who don't know, pilots of their respective aircraft and the drivers of the ground vehicle have to ask for permission from the ATC (Airport Traffic Control) whenever they are using the taxiways at the airport. Once clearance was given, we taxied via the assigned taxiway to the runway threshold and wait for clearance for take off. 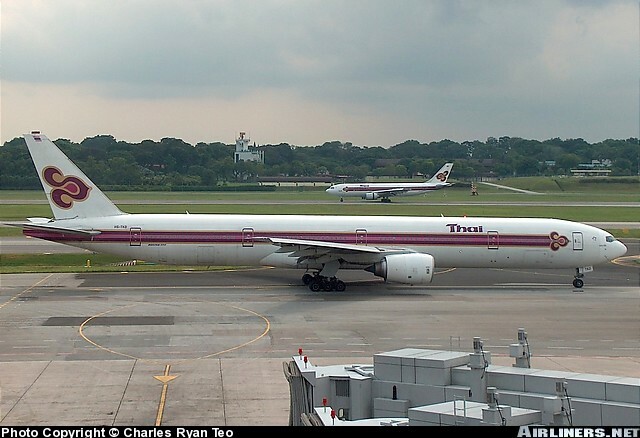 Traffic was pretty light at that time, we waited at the threshold for a couple of departures before it was our turn. Looking at the weather, it was a beautiful day for flying. The wing of the Boeing 787 Dreamliner. 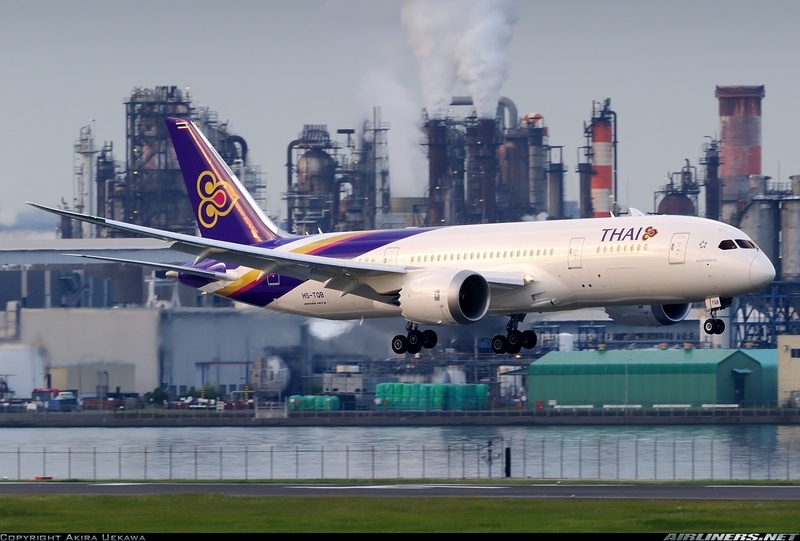 It's always nice to fly on this aircraft - I'am certainly a big fan of the 787 Dreamliner. Flying through some clouds, but nothing bad. At this point, we had started our descend. 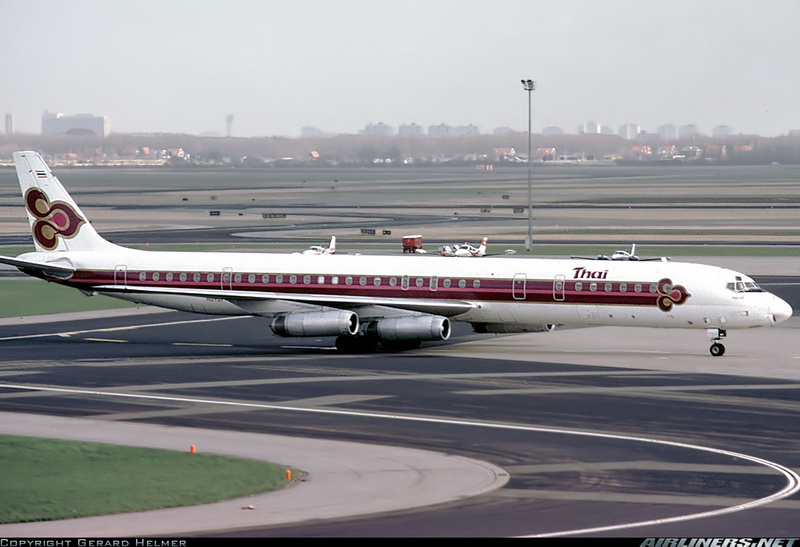 Usual announcements were made and the seat belt sign came on only when the aircraft was at 16,000 feet. This is what you called the Cumulonimbus cloud which can cause turbulence when flying through it, so pilots tend to avoid them if possible. This type of clouds can also produce lightning and form bad weather. We entered Bangkok in this hazy condition. Just a few turns and we were on final approach. On approach to runway 19 L. The flight went pass too quickly for my liking. 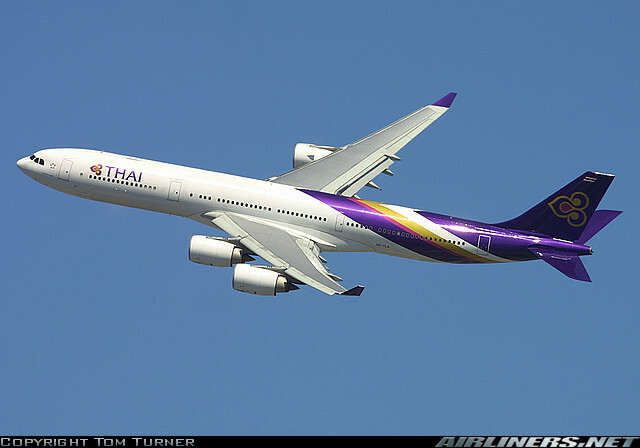 The sight of Bangkok Airport appeared and we landed on runway 19 Left. We taxied around 15 minutes before reaching our assigned parking lot at a remote parking bay. 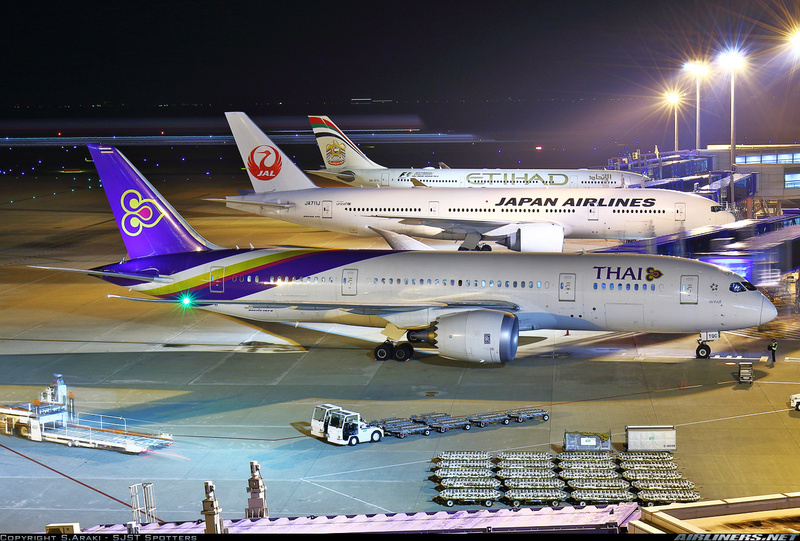 Not many passengers were happy about the aircraft parking at the remote parking lot, but for me I was delighted as it was my first time after many 787 flights, to be able to disembark the aircraft at a remote parking lot. Fortunately for me, no one stopped me from snapping these photos. Thanks for the ride, HS-TQC! 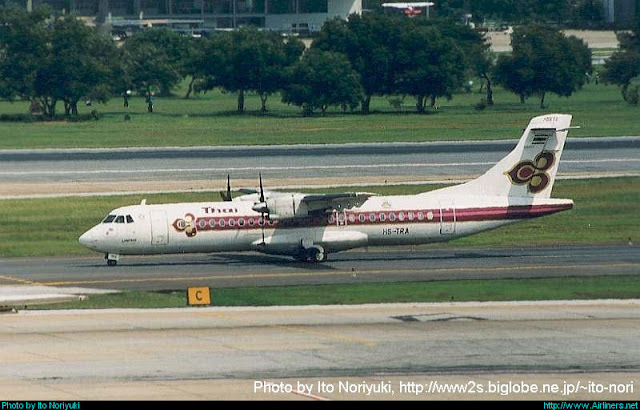 It was my first time arriving at Bangkok using the airport bus to the terminal for international flights. This is where the bus dropped us. Took the escalator to the correct floor and we headed towards the immigration joining the queue of passengers from other flights. I took the taxi to the Phoenix Hotel for the overnight stay before heading to Ho Chi Minh City the following day with a new airline to my flight logbook, Jet Airways! It was a good start to my March 2016 trip! Flying another airline's Boeing 787 aircraft is a great experience for me, able to compare which one has a better product. 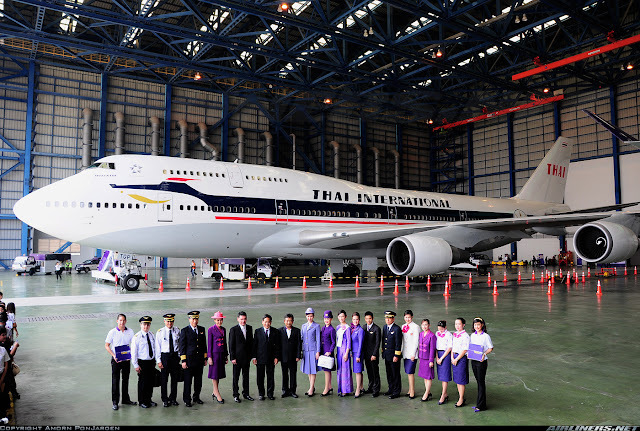 If you ask me, this airline has pretty good Y class seats, and the J class cabin looks pretty decent too. In-flight service could certainly be improved and for these crew, coming from the land of smiles, they should smile more. At least I was granted access to snap some quite photos of the J class cabin, so no complaints there and also got my food and drink as requested. Do note that the other aircraft types have different products than this aircraft so if you book yourself with Thai, and you get an older product, don't be disappointed. 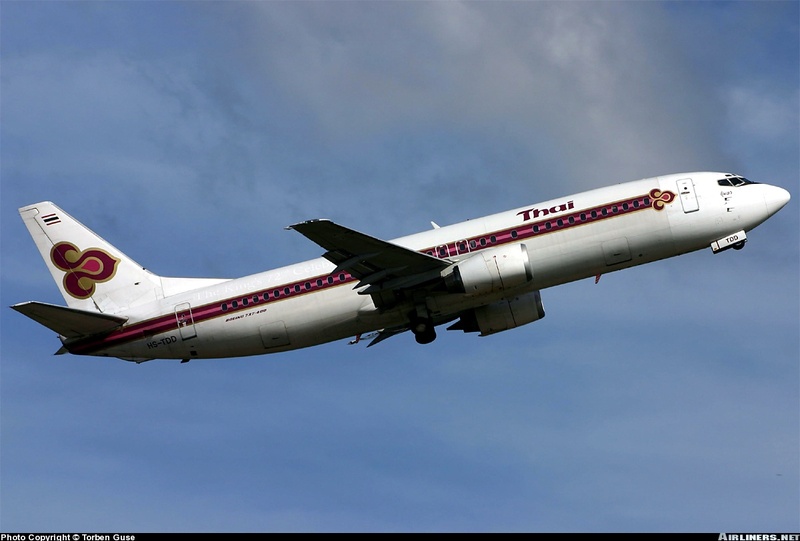 This airline hasn't been doing well financially with some routes making losses and possibly too many aircraft types. The Boeing 747-400 may be a very good aircraft but its operating cost is pretty high, fortunately the fuel prices is currently low, otherwise we might see them being phrased out at a faster rate. 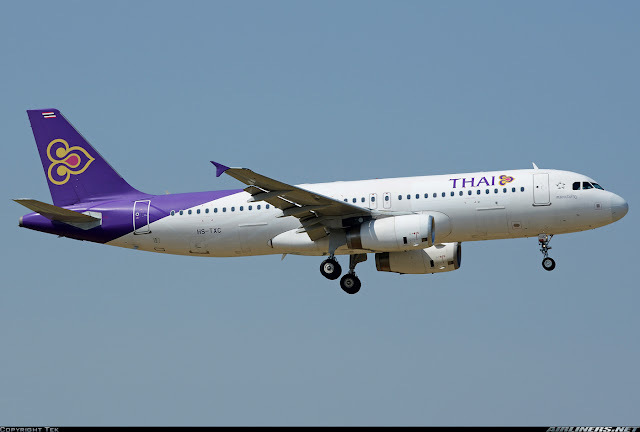 What I hope to see from this airline is more consistency and standard in-flight products across the fleet, except the narrow-body (Airbus A320). 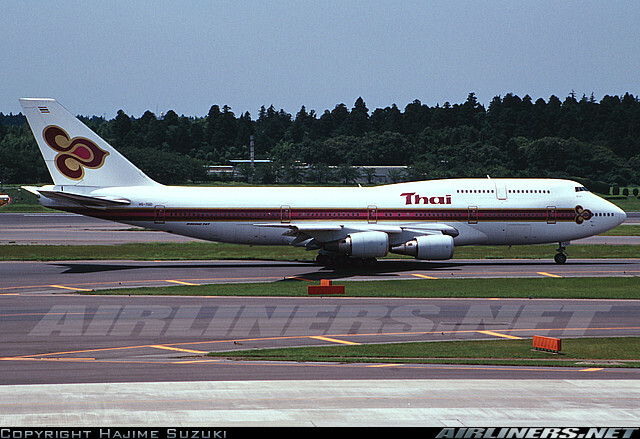 For now the Boeing 747-400 will continue to operate for a few more years, no announcement of its retirement date for the remaining aircraft (Some have either been converted to Freighter) yet. 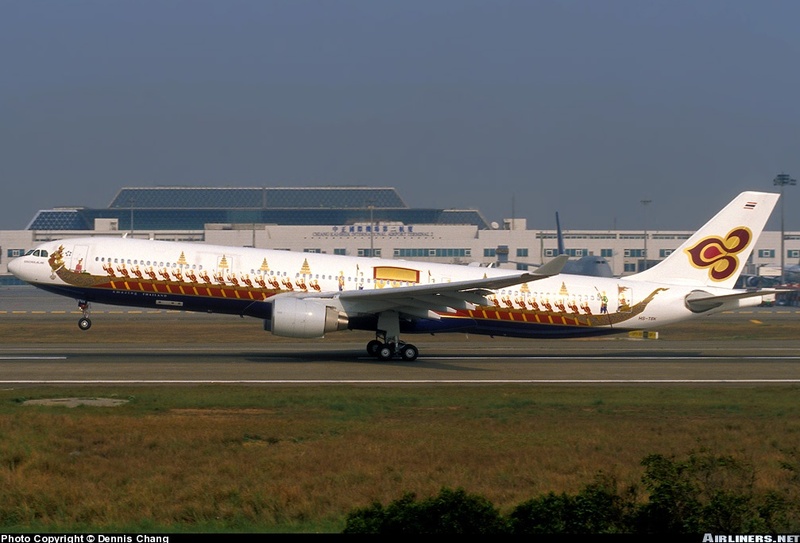 This airline will take delivery of its first Airbus A350-900 in the 2nd quarter of 2016. 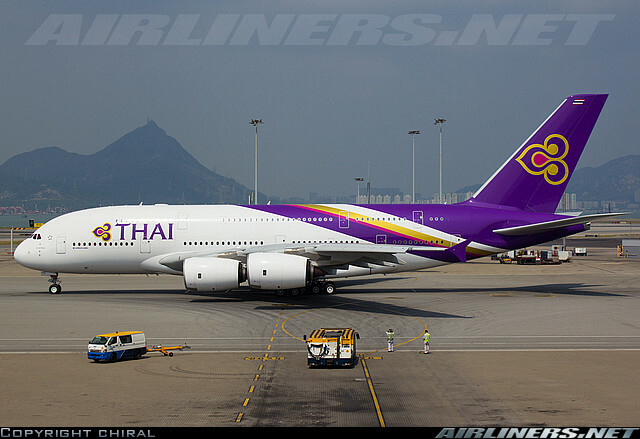 As for the Airbus A380, the airline is looking to offload them in the near future, its not because its a bad plane, but because the capacity of the aircraft is too much for the airline. Overall, I am happy with my Thai experience once again and looking forward to try this airline's Airbus A350 once it starts commercial service. 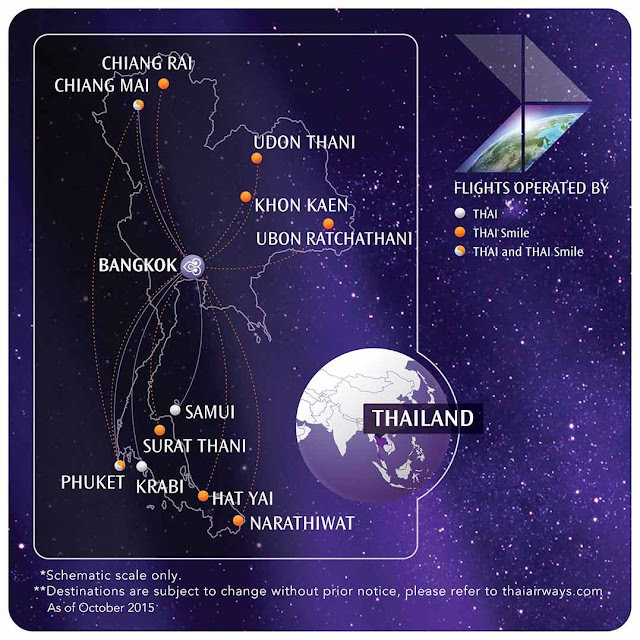 Do check out my other trip report of Thai Airways at the links below. Enjoyed that Charles, still waiting to try the 787 but A350 and A380 to come first. Has a great service and highly recommended. Food was also good and plenty. I would travel with them again to Europe and the rest of the world.